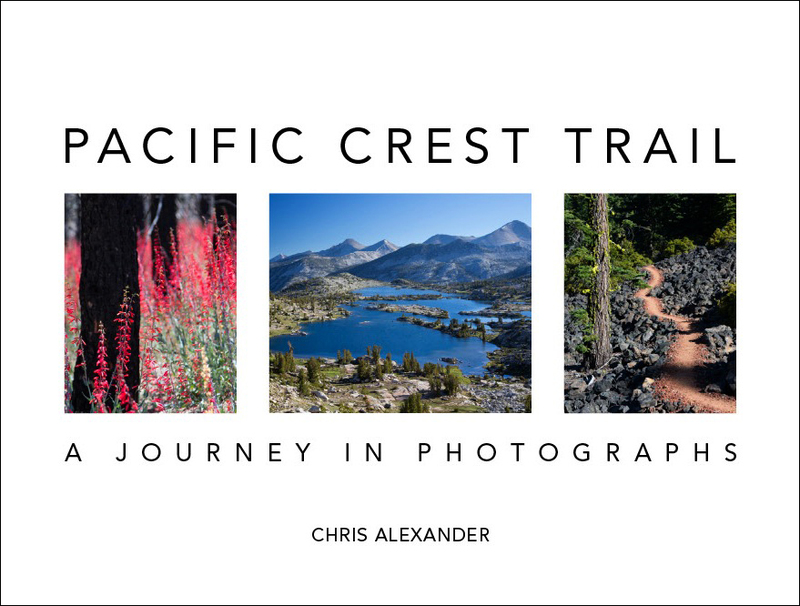 The Pacific Crest Trail, as the name implies, follows crests of mountain ranges, so we have come to expect ups and downs. But when we looked at the elevation graphs for the upcoming section of trail, we knew we were in for a doozy. From Idyllwild we walked up the Devils Slide trail to Saddle Junction. The trail snakes up the mountainside, climbing 1700 feet in two and a half miles. After reaching Saddle Junction, we walked a few miles then stopped to heat up ramen at a nice spot with a view. We climbed further to Fuller Ridge at 8800 feet. 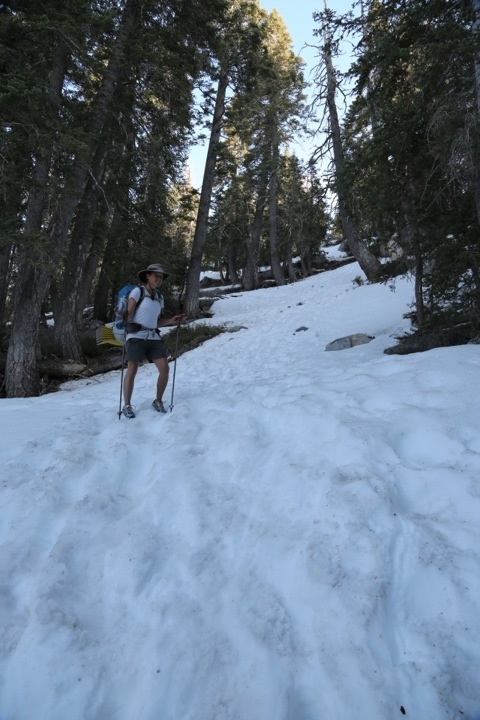 We encountered significant snow there which slowed our progress. While the trail was passable, the snow was icy and slippery and we each fell. We wished we had our Microspikes. We were carrying 9 days of food, and the extra weight caused our packs to work against us when we shifted our weight on snowy slopes. This was a rough day mentally for Anna. Finally, losing sunlight and tired, we found a small meadow (half snow covered) suitable for camping. We ate cheese and dried cherries and camped there. We woke to frost on the tent and found the water we’d stored inside the tent partially frozen. 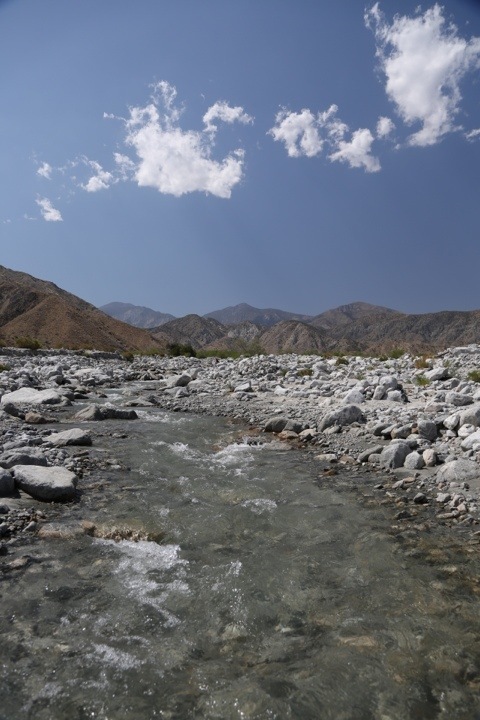 We walked to a tiny ice-cold creek where we filled most of our water containers, as we were about to begin a 15-mile stretch without water. It was quite cold at 8000 feet where we began our daylong descent. At first we hiked in our puffy jackets. As we descended we shed those, as well as our thin nylon jackets, hats, and zip-off pant legs. 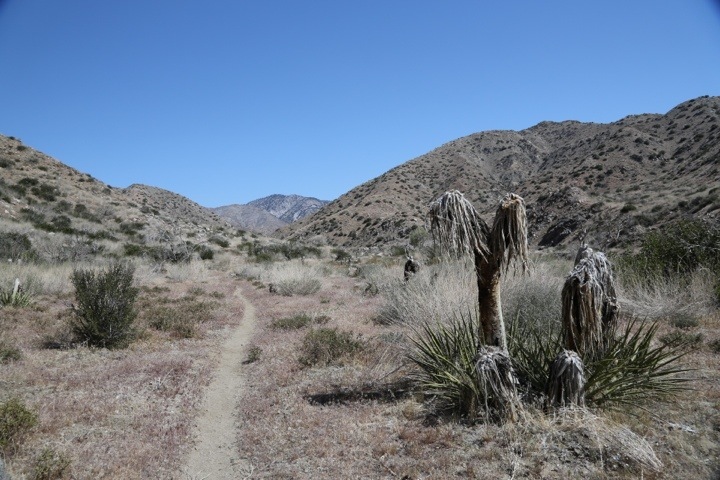 Soon we found the pine forest transitioning to desert, complete with snakes and yucca. In the next ten miles we saw two rattlesnakes and (likely) a tarantula, and Anna got stung by a bee on her nose! 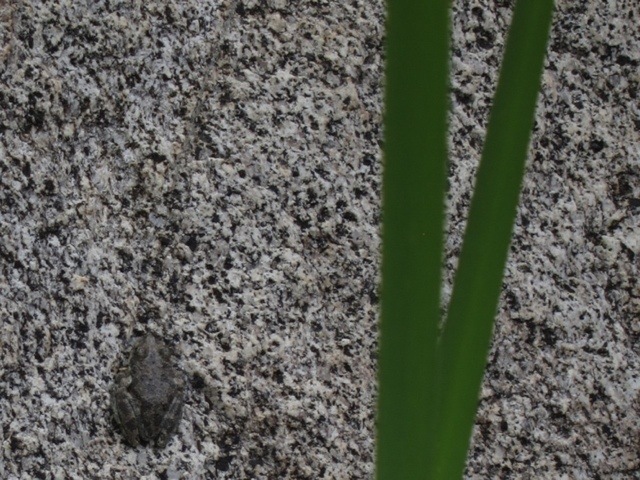 We also found two really cool frogs that had perfect rock-like camouflage. 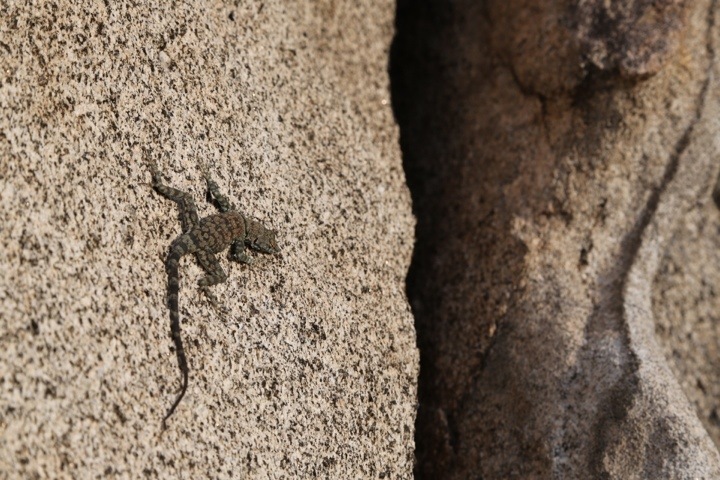 In addition, we saw several other snakes, a dozen horny toads, and probably a hundred lizards. Amidst this bevy of wildlife, we passed the 200 mile mark! And as a fitting way to celebrate, Anna noticed that she had worn two holes in one of her socks! After even more descending, we arrived at the Snow Canyon Road water faucet. We had walked our longest mileage yet (16.5 miles), and completed our greatest descent (6000 feet). We ate a bit, set up the tent and watched bats swoop and dive after insects. 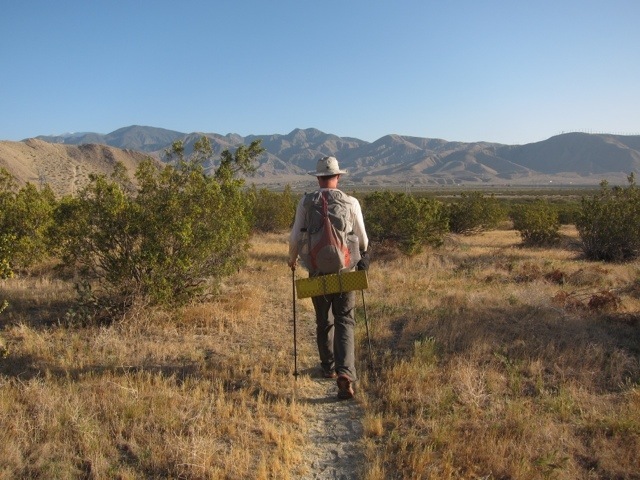 The day began with a flat desert walk which led us under the I-10 freeway and near the town of Whitewater. There were massive wind turbines all around us. 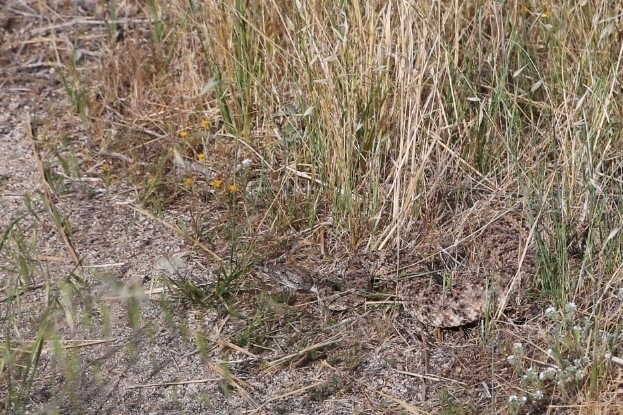 Due to our fast pace, Chris almost stepped on a gopher snake, which was large but not perturbed. We stopped at the Mesa Wind Farm office and bought five ice cream bars! Today Chris also treated his first blister. Our feet and bodies are doing remarkably well, especially compared to many other hikers we chat with. We should also note that Anna’s shin splints grow less each day and have almost disappeared. The hike just after the wind farm was steep and very hot. We didn’t see a single shady spot for miles so we took a break in full sun and ate a melted snickers bar. After a few more miles of walking, we confirmed a total lack of shady spots. However we did find butterflies. Finally, feeling well done, or at least medium rare, we reached the Whitewater River and dipped our feet in. It felt wonderful. About a mile past the river we found a flat camping spot. After 3000 feet of climbing in heavy heat, sleep came quickly. We woke at 5 and made great progress on the uphill in the morning. By noon we were wavering in the relentless heat. The heat was taking its toll on Chris so we decided to call it an early night and camp after 14 miles of walking. We knew we’d need the extra energy to tackle the remainder of the mountain the next day. At our shady, cool campsite, other hikers began to join us as evening approached. We chatted for a couple hours with Rick, who told us funny stories. Eventually Jaunty and Caveman showed up, and they were both quite friendly as well. As the sun set, we all slept. Thanks for the kind words, Brenda! We decided it was best to share the true experience of the trail, which as you mention is a mix of highs and lows. The rough days just make the good ones that much sweeter. How many hikers do you meet each day? Does it help to see others, and chat with them? 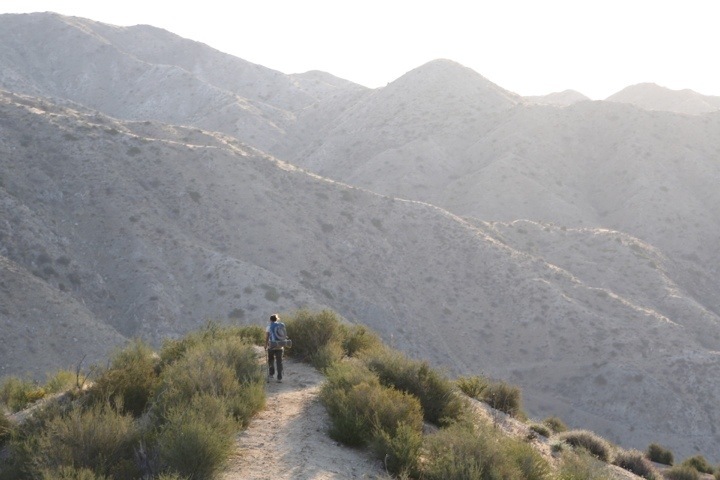 Are most of the others hiking just part of the PCT – or all of it? Your postings are fascinating! Some days we see 20 or 30 people, and some days, 2. On average we’ll run into maybe 10 in a day. People tend to cluster near water in the desert, so that’s where we usually see the most. It’s fun to meet new people, and we will trade strategies, information, and advice too. It’s a cool part of the experience for sure. We’ve met all kinds of people on the trail, too. Some super fit and some not, some highly educated and some not, and people from England, Hawaii, Japan, and New Zealand too. Everyone walks at their own pace, so we don’t often stay with others for too long, but we might run into each other again farther down the trail. When you talked about Anna getting stung on her nose, I thought the next pic would be…. We don’t have trail names yet, but we will certainly post about it if we get them. We’ve mused a bit about hat people might give us, but you just never know. We don’t have a thermometer so we don’t know the exact temperature, but frost and frozen water tell us it’s below freezing of course. Generally we have a sense of how it will be based on the elevation. A balmy night at 1000 feet means a chilly one at 8000. We do keep tabs on the weather, because it’s nice to know if a storm is coming. But basically we just put on layers based on how cold it is at the moment. The bees around here are very aggressive! We have to watch out if there’s a hive near the trail. They will defend it. So, someone else gives you your trail name? How does that happen? Yes, it’s an organic process, and usually people don’t name themselves, so we figure it will happen when it’s time. A trail name can arise from a specific incident, or it can appear over time and stick to you, like a nickname. beautiful landscape! it’s amazing how you can go from dreadfully hot one day to ice on your tent the next. the desert is wonderful like that. can’t wait for all the pics to come of the sierras! glad your trip is going great so far! Thanks, Stephanie! I had read about how fickle the weather is in the desert, but it’s still surprising to experience these dramatic changes in such a short amount of time. We are excited for the Sierras too. 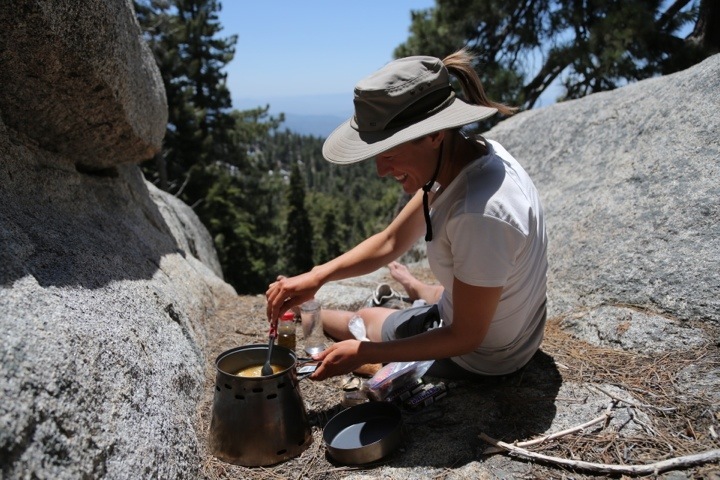 Many past thru hikers say it was their favorite section of the PCT. Hi there! Love the blog. Glad I found it early in your adventure. Really looking forward to following your progress. Happy trails guys. Willie. Thanks very much, Willie! We’re really excited to be able to share our experiences this way. It’s even better when other people get excited along with us. Cheers! 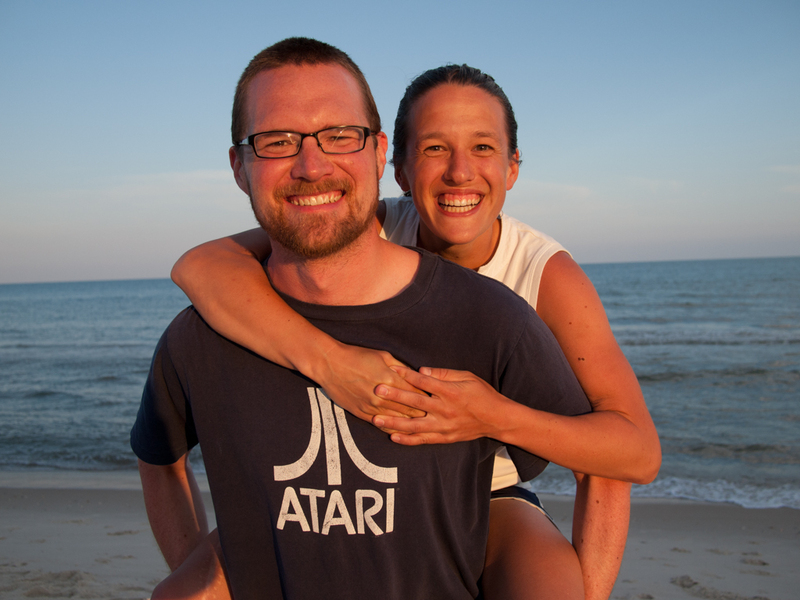 Anna and Chris- hope today finds you well! Those elevation trail charts are cool… And impressive. Am enjoying hearing about and seeing the critters and plants that you see. Happy trails! Thanks Suzanne! 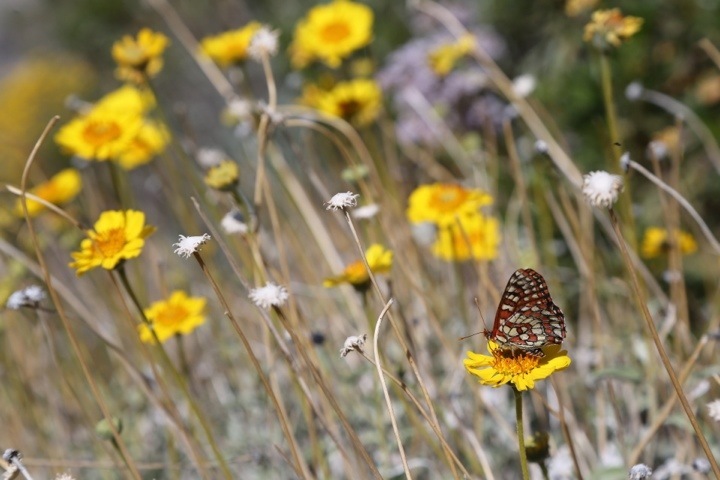 We are enjoying our walk high above Big Bear today, and the weather is really nice. We have elevation plots like those for the whole trail, and they help to give a general sense of strenuousness. But we’ve found a lot of the difficulty has to do with how tired or hot we are, or how much power is left in our muscles. Early mornings are a great time to climb because it’s cool and we are fresh. Congrats on reaching Big Bear. Time for a little R&R? Thanks Dad! We are actually walking a couple days past Big Bear since Anna’s family hasn’t arrived yet. They will pick us up and bring us back when they get here. But yes, then we’ll get some good resting in, and tons of eating too. We had great views of the town and the lake today, as we walked along the ridge high above the lake. We’re excited! Life is a little more challenging for you two than those of us in Bermuda! But you seem to be doing great in spite of the challenges of the trail. It’s so great to hear about your adventures. Thanks Mom, we are indeed having a great time. It helps that both of us love a challenge, and most of all we love being out here. Hope you and Dad are doing some great relaxing!